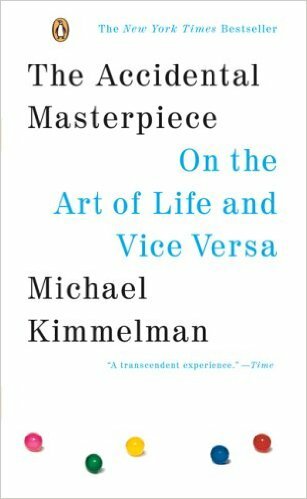 In his elegantly written and accessible read, “The Accidental Masterpiece: On the Art of Life and Vice Versa,” Michael Kimmelman, chief art critic for the New York Times, explores the creative process as it is revealed in the lives of artists and non-artists alike. Kimmelman brings a critic’s knowledge to this series of essays examining the insights, consolations, and epiphanies that an artful life yields; his manner, though, is so affable and unassuming that each read feels like a series of entertaining anecdotes and observations shared over a good meal. Some of the great artists of the past century are his subjects, but they share equal billing with the artists in all of us – the avid collector, the hobbyist painter, and the amateur photographer. Kimmelman’s gaze goes far and deep in his pursuit of the life of art and the art of life: from a dentist who dedicated his life to amassing the largest collection of light bulbs, to the secluded life and art of Pierre Bonnard, and the “mammoth quasi-diary of gouaches and accompanying texts,” of a young Jewish woman who perished in the Holocaust. Kimmelman is equally comfortable culling insight from the work of conceptual artists, like Ray Johnson — whose ultimate performance was his own suicide — as he is from golden-voiced TV-personalities like Bob Ross. From Ross, Kimmelman says, , we learn a basic reason for making art – “to have a place to indulge your id and comfort your ego, an area of authority, where perhaps, secondarily, with luck and little effort, you might make something good enough to hang on the wall or show to strangers.” For Kimmelman, the 1950s paint-by-numbers phenomenon, of which, he tells us, Ike was an avid practitioner, is as important to understanding the artful life as are the remote land art of the American West. In each of his essays, Kimmelman has a point, an idea about life and/or art that he is trying (essaying) to flesh out. In the opening paragraph of “The Art of Having a Lofty Perspective” he says “If, like most people, you have ever walked into a museum or gallery or looked at a picture in a magazine or newspaper and wondered how anything so ugly and lacking in taste had come to be considered art . . .” and with the remainder of the essay examines what constitutes the beautiful and its susceptibility to change. But it is the anecdotes, the facts, and the quotes with which Kimmelman peppers his path, that are the most enjoyable aspect of the journey. Kimmelman’s penultimate essay,“The Art of Pilgrimage,” is an exploration of the earth art movement, which in an age of traveling blockbuster exhibitions and inexpensive jet travel, has restored the pilgrimage aspect of seeing a work of art. Traveling from Marfa, Texas to Nevada’s Great Basin, he introduces us to the grandiose visions and personalities of artists like Donald Judd and Michael Heizer. And far from any ivory tower experience, at the end of the essay we find the author near Wendover, Utah, lost, alone, in increasing darkness, trudging through chest-high, cold, salt water. All because he was trying to get a look at one of the shots of the Salt Flats in Matthew Barney’s Cremaster series. His lesson? “Not all art comes to you, or even should come to you, easily. Sometimes you have to go to some length to meet it. After these grand tours across grand vistas and grand artists, Kimmelman easies us out of his book with a quiet and charming look at the “beauty of ordinary things” in the paintings of Jean-Baptiste-Simeon Chardin and Wayne Theibaud. The conjunction of these last two essays, or even these last two artists, is the beauty of Kimmelman’s book — it is not an argument for or against any type of art, but an argument for art itself. An argument for the making of art and the living of art and the making life an artform in itself.